Miriam Moskowitz leaves federal court, Monday, Aug. 25, 2014 (AP Photo/Lawrence Neumeister). 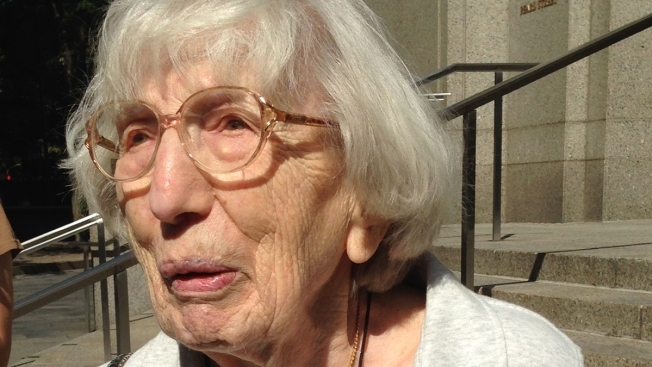 A 98-year-old New Jersey woman lost her bid Thursday to persuade a judge to erase her 1950 conviction for conspiracy to obstruct justice in the run-up to the atomic spying trial of Julius and Ethel Rosenberg. U.S. District Judge Alvin K. Hellerstein rejected Miriam Moskowitz's unusual request immediately after hearing oral arguments, saying her lawyers failed to show that transcripts of grand jury statements by the lone witness against her would have changed her trial's result. Moskowitz, who lives in Washington Township in Bergen County, New Jersey, served a two-year prison sentence after her conspiracy conviction. Outside court, she said she was disappointed and referenced the McCarthy era, when fear of Communism was rampant in the United States and a blacklist made it hard for some to find work. "Too bad," Moskowitz said of Hellerstein's ruling. "My 98-year-old life goes on, and it's not affected me one way or the other except I am disappointed because it reflects ... the prejudice of the McCarthy era." The government had opposed Moskowitz's request, saying the evidence supported her conviction and that she conspired with two men to lie to a grand jury investigating allegations of atomic espionage. "Her claims, even if taken at face value, are insufficient to establish an error under today's law, let alone the law when she was convicted in 1950," prosecutors argued in court papers. Moskowitz's lawyers said FBI and grand jury statements by the key government witness against her -- Harry Gold -- were withheld from the defense. They said the papers showed that Gold repeatedly told the FBI that Moskowitz was unaware of plans by others to lie before the grand jury until the government threatened him with the death penalty. Assistant U.S. Attorney Robert Allen told Hellerstein on Thursday that the jury heard statements at trial that were similar to statements Moskowitz's lawyers claim are new. Gold served about half of a 30-year prison sentence after he pleaded guilty to violating the espionage act. The Rosenbergs were convicted of passing nuclear weapons secrets to the Soviet Union and were executed in 1953. Since then, decoded Soviet cables have appeared to confirm that Julius Rosenberg was a spy, but doubts have remained about Ethel Rosenberg's involvement.